Suigian (水戯庵), a sushi restaurant featuring a noh stage, is set to open in Nihonbashi (Tokyo) on March 20, 2018. The restaurant will offer daily performances of Noh and Kyogen. I have mixed feelings about it. Yes offering this kind of performance is not philologically incorrect as people did eat drink and even smoke inside noh theatres in the past. Yes, we need to bring more people closer to noh so we should embrace ways to popularize it. But would you like to watch noh with the noise of people drinking cheering chewing etc? With the smell of food and alcoholic burps in the air? Would performers like it? The restaurant looks posh enough and is endorsed by performers (you can see famous actors and musicians featuring the photos on the website) still… I wonder what plays they will perform… in the case of Noh, I can think of very few that I would enjoy watching while having something in my stomach… I wonder what you guys think! Shochiku Kabuki X Uniqlo = Iemoto Noh X Nothing? Popular Japanese apparel company Uniqlo has teamed up with Kabuki management company Shochiku to produce a series of t-shirts, trousers and accessories using Kabuki costume pattern designs as well as well as kumadori make-up impression known as oshiguma. 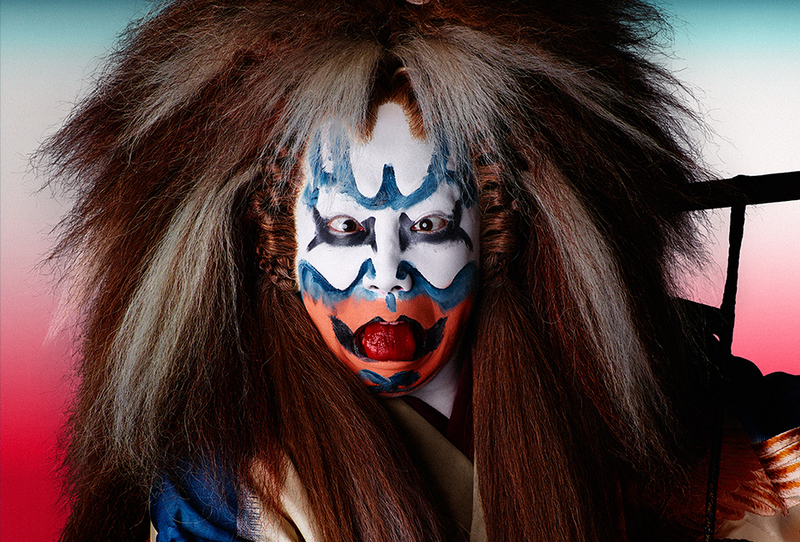 It makes a lot of sense to me: Kabuki costumes have great designs that look very ‘cool’ to the contemporary eye. So do Noh costumes, which served as models for Kabuki costumes in the early days. I hope that the Kabuki establishment will benefit from this mutual form of promotion, but I also ask myself why Noh is not doing this. It’s a rhetorical question: regardless of the more or less awkward attempts to popularise it, Noh remains an art for the elite. Its political system is elitarian, and so is the image it projects to the public. Uniqlo is a cheap fashion brand with a ‘pop’ international image. The two brands do not seem to go together. Most Noh people will agree with this, and rejoice in their elitarianism, leaving the cheap and pop stuff to Kabuki people. However some (a minority) Noh actors, especially the young generations, might disagree. This is the generation that will still be here in 30 years, and will experience the consequences of the current conservative policy enforced by the oligarchy of elders. What is more important? Maintain the elite as it is, or try to find new ways to get more people come to the half-empty Noh theatres? Posted on 29/03/2015 12/02/2016 Categories GeneralTags elite, Kabuki, politics, popularization, Uniqlo2 Comments on Shochiku Kabuki X Uniqlo = Iemoto Noh X Nothing?